Is EuroLottery a Scam or Legit? Read Reviews! 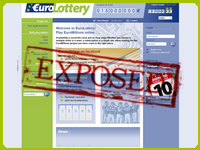 Eurolottery Exposed — Is It a Good Place to Play EuroMillions? Yet another online lottery site that only offers one game. €urolottery.lu only offers EuroMillions though they do offer single line tickets and syndicates. This site’s primary language is German but if that’s not your language, click on the little box on the right had side of the screen also for English and Dutch. The English translation is quaint using words like “available… no loops ways”. Thankfully, the terms and conditions have been translated a little more carefully. This site offers one game – EuroMillions – in either single tickets or one of three types of syndicates. Players can play a single ticket or multiple tickets from 1 to 4 draws. Click on “Carry Over” and you can add more tickets. Subscriptions are available though you do have to click the button to request this (that’s good). Eurolottery says players receive 100% of their winnings with no commissions charged. I suspect there are fees involved with the actual transfer but that is pretty standard. €urolottery.lu offers three syndicates, Silver, Gold Plus and Diamond Plus. Silver has 144 rows for 4 draws. Each ‘team’ has 27 participants. Ticket lines are calculated automatically through their system of choosing 5 numbers and 9 and players do not know their numbers until the purchase is complete. The only thing that I would disagree about is the fact that the price is shown per draw but the buy-in is 4 draws. It’s not until you purchase the play that it calculates the full cost. The other thing – beware the automatically clicked subscription box! If you do not want a subscription (an automatic renewal charged to your account), then make sure you unclick the box. Gold Plus offers 228 with “clever playing with a system plus own personal row”. This means each syndicate member actually chooses one ticket line and then €urolottery.lu’s system picks the rest for 54 syndicate participants Their system uses 8 numbers and two stars in different combinations which they feel increases the odds on winnings. It’s for a minimum of 4 draws and yes, again beware the subscription checked box. Diamond Plus offers a combination of an individual bet with Eurolottery.lu’s system picking the rest making up a subscription of 505 rows. Their system here combines 6 numbers and 7 stars to make up the ticket lines. The syndicate has 88 participants. Ditto with the subscription button. Who Can Play at Eurolottery.lu? Players must be 18 years of age or older. Residents of the USA, Switzerland and Luxemburg cannot play here. Anyone else is welcome as long as they are not in violation of their own country’s rules. It is a little weird that into the registration area, there is a drop down window of countries – and there are a heap not there. €urolottery.lu is operated by a company in Luxemburg called Sensit Communications GmbH. BP. Winnings are handled by another company out of Switzerland called SENSIT-IPS Service GmbH. There is a snail mail and email address, plus online form. There is no live chat or telephone numbers. Eurolottery.lu says they specialize in ‘offering exclusive systems’ especially for lottery pools. Would you mind rating EuroLottery.lu? There are a lot of arguments on different systems that potentially increase the odds on winning. I personally do not agree with a number combo system but then some of our team does. It’s definitely a personal choice. What our team did agree on is that they wouldn’t chose to play somewhere where there is only one lottery offered. Eurolottery.lu gets a thumbs up for clarity especially on their syndicates and a thumbs down for only having one lottery, EuroMillions. It is a lottery that gets up there in those mega numbers, but most players like the option of playing some of the other international lotteries. I personally do not like online lottery providers that only offer one lottery. For me, especially as some of the lotteries that I don’t usually play grow, I want the option to be able to play, especially when they really get up to those mega numbers. Just one lottery offered does not work for me!